Foot and mouth notices, Derbyshire, 24 November 1967. Notices at a London train station, 31 August 1939. Damaged railway notices, Wales, January 1964. The New England Viaduct, 1857. LMS staff notice threatening striking employees with dismissal, 1926. 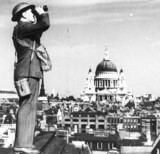 A city raid spotter, London, World War Two, November 1940. 'The New England Viaduct on the London & Brighton Railway', 1857. 'A notice for all non-penguins', BR poster, 1995. 'The Historic Heart of England: Royal Leamington Spa', BR poster, 1948-1965. 'England and Cork - Direct Service', GWR poster, 1919. St George's Hospital, Hyde Park Corner, London, c 1837.